So much love for Carolyn Mackler's "Infinite In Between"
I'm currently feeling so much love for Carolyn Mackler's "Infinite in Between." 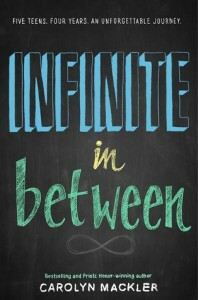 Despite its large scope (5 teens, 5 perspectives, all 4 years of high school), "Infinite" manages to feel strikingly quiet. Like in life, all the tiny moments add up, and in the end, what you feel is the ultimate reward: a greater appreciation for those tiny "in-between" moments that really, unexpectedly, mark the ways we grow as individuals. In the way the film "Boyhood" does, "Infinite in Between" pulls off something remarkable: it manages to be both epic and intimate. Never once does it feel grandiose or unwieldy. And it sure sparkles on every page.